Following the movie’s success, its sequel will feature more realistic explosion scenes and iconic architectural sites in Hong Kong. The 2017 film Shock Wave <拆彈專家> starring Andy Lau (劉德華) emerged as the top-rated Labor Day film in China, breaking traditional boundaries of the crime thriller genre. Last week, work on the second installment of the movie officially started filming in Hong Kong. 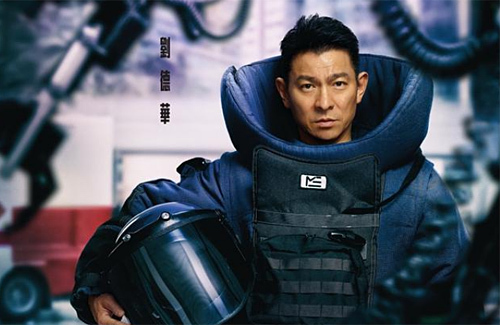 The sequel will once again feature the golden team of Andy Lau as producer and lead actor, and Herman Yau (邱禮濤) as director, while adding to the scale of the story’s development and portrayal. Sean Lau (劉青雲) and Mainland Chinese actress Ni Ni (倪妮) are also part of the cast. According to sources, the film will boast an improved budget of $280 million HKD to boost the production quality. Besides enhancing the realism of bomb disposal and explosion scenes, key scenes will also be filmed on location at the sites of Hong Kong’s key architectural icons. During the film’s opening ceremony, Sean recalled his previous collaboration with Andy in 1999’s Running Out of Time <暗戰> in which the two actors developed good chemistry. He will pair up with Andy as his EOD (Explosive Ordinance Disposal) teammate in this sequel. Ni Ni will play a female cop. A key character, she will have a romantic arc with Andy, and also be implicated in an important twist to the plot. The 30-year old actress shared that she has learned a lot from her first filming experience in Hong Kong, adding that Andy was very protective of her, making her feel very secure. Shock Wave 2 features an impressive supporting cast, with many recognized faces such as Tse Kwan Ho (謝君豪), Marc Ma (馬浴柯), Philip Keung (姜皓文), and Timmy Hung (洪天明). I thought Andy’s character died in Shock Wave 1? So this must a complete new story I guess.